This is a quote from the book ‘The Software Craftsman: Professionalism, Pragmatism, Pride’ by Sandro Mancuso. It is a book about passion. It is about passion as the main ingredient of a software developer, to make him or her a craftsman. When we read the above quote and we think about how many software projects are actually successful, the question rises: “How can software development be awesome, since there are so many failures?” It is easy to blame all these failures on the organization, waterfall process, mediocre colleagues, management or ivory tower architects. But the truth is that many things can be fixed by yourself. The implementation of the different Agile processes, mainly Scrum these days, helped organizations to do the right thing. Just in time prioritizing and quickly responding to changes makes sure that IT can deliver the highest business value. However, we still see delayed projects and way too complex applications that nobody dare to change after some time. So basically companies are still stuck on their IT after some time. However, this can be avoided by doing the thing right. There are many best practices to build high quality software that does not suffer from ‘code rot’, many of those coming from eXtreme Programming (XP). In his book Mancuso highlights the necessity of quality software. He points out that this can only really be achieved by so-called Software Craftsmen. These are software developers who are passionate, care about their craft and want to share this with their teams. 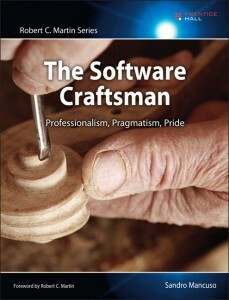 The first part of the book focusses on how you become a Software Craftsman yourself. Several things play a role. Your attitude and passion are the most important. But there are also several practices that are recommended by other software craftsmen. There is also the advice to take ownership of your career and how you shape it to become a craftsman. In the second part of the book, Mancuso offers insights on how to transform your company to attract excellent developers, motivate the teams and how to start using the best practices of the craft. When reading the book I realized that many ideas resonated strongly with how I feel about software development as a profession. Especially the parts about passion and how to handle negative feedback on good ideas helped me to become more motivated. Also there are many things that I don’t do. I have always somewhat ignored the XP practices (although I cannot give a good reason for this). I feel that I must research these practices better. I must do a better job of understanding them and mastering them. At least I will know for sure what to use and why. I recommend this book to all software developers who care about their craft and who want to be motivated (again). You can follow Sandro Mancuso on Twitter: @sandromancuso, or on his blog. There is also a Software Craftsmanship manifesto. This entry was posted in Book reviews and tagged Agile, Software Craftsmanship, software development, XP. Bookmark the permalink.